Maria Elliott is a Chartered Physiotherapist and Pelvic Pain Specialist. 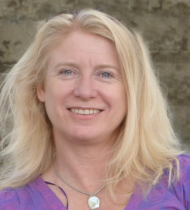 She has gained over 25 years of experience as a “hands-on” physiotherapist after gaining her 1st Class honours from Trinity College in Dublin in 1986. She has since practised physiotherapy in Chicago, France and now in the UK and has worked in both the NHS and private sector.Maria is a members of the Association of Chartered Physiotherapists in Women’s Health and an APPI Pilates instructor. Maria has always had an interest in Women’s Health and was trained in France in Post Natal Rehabilitation, she later set up the Physiotherapy Continence Services at Chelsea & Westminster Hospital, and their post-natal rehab programme. Since 2002Maria specialised and trained in Chronic Pelvic Pain Rehab and has close links with other World specialists in The United States and Ireland. She runs the “Pelvic People” team of physiotherapists at New Medicine Group that offers Pelvic Pain Recovery services to Women, men and children. Maria also offers Post Natal Rehabilitation services. and works closely with the other members of the New Medicine Group, and outside specialist such as Urologists, to offer comprehensive psychological, health and pain support. Maria is the director and founder of Simply Women’s Health a physiotherapy practise specialised in general Women’s Health. Maria is highly trained in manual therapy for the abdominal and pelvic area. The basis of treatment involves deep tissue release work; lengthening of tight short structures in the pelvic area; abdominal massage to release the diaphragm; improving blood flow to the pelvis and releasing the pelvic floor. She offers Pelvic Pain Coaching and combines advice on nutrition, exercise, mindfulness and breath work to aid full recovery; she is always passionate and energetic in her approach to recovery.